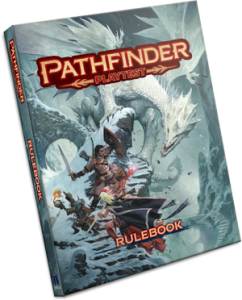 Before we dive into the nit and grit of the system, let me first clearly state where I’m coming from: I did not expect Pathfinder Playtest to be a continuation of Pathfinder as far as complexity is concerned; indeed, that would be a fallacy, as the game, system-immanently can’t yet sport the same level of depth that Pathfinder 1 offered. If you stop for a second and think about it, Pathfinder 1 began as pretty much a tweak of 3.5, and only with the Advanced Player’s Guide and later releases such as Ultimate Campaign or Occult Adventures did the game reach the level of complexity and thematic diversity that we nowadays associate with it. Having read the entirety of the Pathfinder Playtest rules, I can clearly state that it is NOT, contrary to what some folks have claimed, a riff on D&D 5e; while there are design-paradigms that feature in both games, there are plenty of distinctions, and Pathfinder Playtest, at least to me, does NOT feel like D&D 5e. If anything, I actually was surprised by how much it feels like Pathinder. As a whole, I have to state that, while I am not particularly fond of every single design-decision (though I do love plenty of them! ), I found myself understanding the rationale for all choices made; I wasn’t baffled by any of them, and, from a design-perspective, understand them. If I had to summarize my impression of PF Playtest, it’s that the game tries to allow for the same level of customization potential as PF 1, while at the same time reducing the ability to min-max the game to a point where the math falls completely apart. If your group sports folks that are capable min-maxers, you’ll definitely have noticed the issues of PF 1 that can spring from skill-boosting etc., particularly in combination with attack-substitution, to just name one prominent example. Now, this design paradigm can be observed in the ability score rules, to note one example: The cap at 18 at level 1 does, from the get-go, prevent the most potent ancestry/class combinations and keeps that aspect in check. The acknowledging of voluntary flaws makes for an interesting side-note – and an obvious means to present flaws that actually *do* provide bonuses in the future. While these should, obviously, be handled with utmost care, it’s still a design-space I did enjoy seeing here, and one that I hope will be expanded one day. Ability score improvement is handled via boosts – these translate to a +2 bonus, and ancestries tend to provide 2, as well as a flaw, which translates to a -2 penalty. That being said, all races have a free ability boost that can be assigned to any score, which means that, should you choose to, you can negate the penalty. This free boost may not be applied to an ability score that has already been boosted by another ability boost. In order to combat the need to use boring ability score-enhancer items, the game has changed how ability scores improve: 5th level and every 5 levels thereafter provide no less than 4 ability boosts to ability scores. These have to be applied to different ability scores, so you can’t jam all of them into a single score. The consequences here are interesting: The levels that present ability boosts thus also represent a significant power-increase for the characters, a change in playstyle, if you will. A level 5 character will be stronger than a level 4 character – and by quite a bit! These later ability boost increases, by the way, do allow for the increase of the ability score beyond the 18-cap. I do think that this can be a great chance for the game; a means to let a story-milestone coincide with a level up, with the progression from a rookie to a veteran; you know, like “Upon becoming a herald for the Baron…, upon becoming initiated into the guild…”; I think that this type of progression does offer for a nice way to make the rules coincide with narrative milestones. The obvious downside here would be that the boost of a total of no less than 8 net points of ability score points; personally, I have always had an issue with “I got a level up” between combats, requiring as a house rule that my PCs get some time to train to represent the growth, making it happen in downtime after extensive training. Depending on campaign structure, these growth spurts *may* stretch my sense of disbelief, but that is a minor sidenote. From a structural point of view, these ability score boost spurts do mean that progression is less linear – if you prefer a slower growth dispersed throughout the levels, this is something to watch out for. That being said, Pathfinder Playtest did not choose these thresholds, if you will, by accident: The increases and the power they convey do seem to coincide with threshold level-caps for e.g. ancestry feats, where level 5 is the requirement for some of the more potent options. All ancestries get a bonus language with Int 14+, with the list depending on the ancestry chosen. This base array does deserve some scrutiny. The base default movement rate is now 25 ft. – for international players that think in the metric system, that’s 7.62 meters, compared to 30 feet being 9.144 meters; for the sake of rounding and playability, let’s say 7,50 m, akin to how previous editions handled that. That is still uneven and, in contrast to 9 meters, not something that you have a precise grip of, size-wise. Personally, I am not the biggest fan here, though square-based movement still, obviously, works: In that case, we’d have 5 squares versus 6. From a tactical perspective, this does not impede tactical combat in a flip-map or grid for international customers, but for mind’s eye theater events, like e.g. an abstract chase, it could be somewhat more clunky and may be an aspect that could be worth reconsidering. There is another aspect that bears mentioning: Darkvision and how it has changed. The ability no longer has a hard limit on its range. This does mean that ranged combat in the lightless depths of the dungeons and subterranean realms has become a whole lot more reliable; it also will have significant impact on how potent ranged combatants are in the realms below – including spellcasters. This also means that darkvision is now, apart from being b/w, is now significantly better than low-light vision in every circumstance. Now, bearing that in mind, take a look at the above again. Do you notice something? Yeah, in a way, the game has taken one aspect from PF 1 that I wasn’t the biggest fan of, and retained it: The ancestries, as presented, do not offer baked in special abilities (excluding the dwarf’s “unburdened” ability as an odd man out), but like n PF 1, they don’t exactly line up on a fair power-scale. Don’t believe me? Okay, let’s take a cue from a book I hated back in the day for its inconsistencies, and assign points to racial ability, shall we? We’ll do the following: Every 5 ft. movement beyond 20 feet nets 1 point. Every base hit point increase-increment beyond 6 nets 1 point. Low-light vision nets a point, darkvision 2 – since it’s now better in every way. A bonus language nets 1 point; a freely assignable bonus language sans limitations nets, and that is generous, 2 points. The additional freely available ability boost of humans nets 1 point for flexibility. All other races arrive at 3 +2s to ability scores, and one -2, for a net gain of +4, same as humans, so 1 point seems fair. Human 8 HP (1 point) + Speed 25 ft. (1 point) + bonus language (1 point) + second freely chosen ability boost (1 point) = 4 points. Now, granted, this breakdown is not perfect. The values are arbitrary and you can choose other metrics to count points; no matter which system you choose, though, you’ll be left with an uneven power-distribution. The system above also does highlight something that worries me regarding future-proofing: There is no room here to do much in the way of design – apart from the dwarven “unburdened” as an odd man out, the base chassis of each ancestry does not offer much in the way of customizing options. Now, the obvious rebuttal to this thesis, and one that is certainly understandable, would be that I have not taken the ancestry feats into account. These, with one gained at 1st level, and one every 4 levels thereafter, represent the customization options, right? Well, yeah, they do; but they don’t really address the discrepancy in power-levels between different races and, one could argue, don’t align internally either. The gnome’s Illusion Sense is significantly more broadly applicable than Animal Speaker, for example. When we compare the flexibility of the elven Ancestral Longevity (which lets you become trained in one skill when you prepare) versus the gnome’s becoming trained in a Lore skill (which upgrades at later levels), the difference is also noticeable. This also ties in with the half-breed options – half-elves and half-orcs further limit the flexibility of the options available for those choosing that path: Becoming one of these requires that a human takes them as ancestry feat, and while this unlocks a whole slew of options, the base benefits you can choose from is pretty potent in comparison: Half-elves can choose +5 ft. speed, for example, while half-orcs can choose +2 Hit Points, which both trump speaking elven and orcish, respectively. Having ancestry feats noted in the class table strikes me as an odd choice, considering how the system is otherwise divorced from individual class progression, but that may just be me. The ancestry rules, as presented, allow for creative design in the respective ancestry feat sections, but as a whole, they do feel restrictive to me. This is, on one hand, a good thing to maintain at least a semblance of balance between races and would, in theory, do balancing via the feat array; however, the ancestry feats don’t account for the discrepancies of base racial option power levels presented by the chassis. As provided, dwarven racial options should be worse than those of halflings, for example. They’re not. Similarly, I do think that elves get pretty potent tricks – while their value comes out as 4 as presented by my arbitrarily chosen metric above, one could argue that the double speed increase renders them more powerful, and their ancestry feats are pretty tough as well, allowing for a further +5 ft. speed-increase, for example. The ancestry section also has a couple of consequences that have me worried to a degree: As noted above, half-breeds suffer somewhat regarding the customization options available, and that will, unless it is changed, also apply to quite a few different ancestries to come, like the inevitable aasimar/tiefling/plane-touched cadre. I am not a fan of making at least the more mundane hybrids require a feat to take them, as it hampers the customization options at character generation. I am not sure about the implications of goblins as a default player race available from the core rules. I get why they’re here. They’re a mascot; they are popular, they are cool. I love them. I love the “We Be Goblins” modules, and they were a reason I stuck with Pathfinder since issue #1 back in the day. However, making them available as a core races does imply a wide-spread goblin population, and a significant amount of goblins in said population that do stray from the destructive and sociopathic tendencies of their kin in order to make them compatible with the default kinda-good-adventuring group morality. This does remind me somewhat of a certain, scimitar-wielding drow and the flood or good renegade drow, as well as the dilution of what made the race stand out. As a person, I enjoyed the goblin-modules BECAUSE they embraced the amoral wackiness of goblins, but I’m not sure how this translates to providing a prominent space in every adventuring group. This also implies a vastly-increased tolerance within the setting, and so far, I have a hard time picturing folks in e.g. Sandpoint that had to witness goblins kill parents or children accept a goblin population in the vicinity from which one can draw adventurers. Secondly, and more mechanically relevant and less a matter of aesthetics, would be that the above chassis for ancestry design does have constraints that will be hard to navigate for certain PF 1 races. Where previously, there were a lot of knobs to pull to account for racial tricks, we are now significantly more limited, particularly when it comes to nonhuman biology. Some of my favorite races fall into this category: Vishkanya toxic blood for example. Or, well, what about gripplis? No one will ever call the likable frog-folk overpowered, but they do have a climb speed. As written, the ancestry-system will have a hard time accounting for the more outré races out there, and this is, in parts, due to the limited design space in the base chassis of the ancestries. Now, don’t get me wrong: I do applaud making many tricks optional via the ancestry feats; I *like* that. However, there is next to nothing that sets the races apart from a biology standpoint. Heritage feats, which may only be chosen at first level, do partially account for the concept we’d expect here, with e.g. elven Keen Hearing or the goblin’s Razor Jaw fitting the bill; however, if you do have one such trick, this does also mean that you don’t have the other ancestry feats available at 1st level. In short, the game does not differentiate between what you’re literally born with, and aspects of your ancestry that may be considered to be more of a question of nurture, rather than nature. “Watching your friends age and die fills you with moroseness that girds you against harmful effects” to me, is not something I’d place on the same level as having been born with exceptional hearing. It’s a subtle tonal disjoint, but one that irks me to no end on a flavor side of things. On a rules-side of things, these may well be in line with one another, power-wise, but ultimately add a hard limitation that implies being born with gifts being detrimental to your development otherwise. I am not the biggest fan of this notion. Speaking of which: I am somewhat appalled that halflings and humans RAW can no longer (as in PF 1 via Fleet of Foot) run as fast as elves; they have always been as quick as the big folk, and it’s a pretty central part of the concept; halfling rogues in an elven city are particularly unlucky – up to 10 feet of movement discrepancy, with no feat for the halflings to offset that? Integrate a base racial trait, such as the dwarven unburdened (which is already here…), the Lucky Halfling feat or similar choices into the base chassis of the race. This would furthermore allow for a more nuanced design space. Be more consequent regarding ancestry feats: Grant each ancestry two feats at 1st level: One that needs to be a heritage feat, one that needs to be a regular ancestry feat. Significantly expand heritage feats available. The former would be the biological variations, the second would represent the variations that stem more from the cultural context, such as being Plucky of Forlorn. This does not change the limited design space in the base racial array, mind you, but it does increase option breadth. Combine the two. This would, indeed, be my preferred solution: Let the halflings be lucky to account for their sucky base chassis, let the goblins have their Flame Heart to make them less flammable as an evolution of their species…and then let them choose a heritage feat and an ancestry feat to customize their biology and upbringing. This would leave both base chassis and the feats, as a totality, as a design space. Either way, I do hope that Paizo will add some tweaks to the system here – I do like the notion presented here, but for future-proofing, I certainly hope that tweaks akin to those I proposed are implemented. Otherwise, I can see e.g. kitsune and similar races feel very samey at low levels. All right, thank you for reading! Next up, I’ll tackle backgrounds as well as skills and feats! Will you make a P.S. regarding the 1.4 update? They’ve implemented many changes similar to what you have proposed, and I think Ancestry’s a better system now. thanks Thilo for participating of Mythic mania 2 of legendary games. I no its not the place for this commentary but please let me said to you i very like your p^resence in this KS. Thanks you and see you maybe in this KS. Loving this analysis of the PF2 playtest material! Looking forward to further additions!